Diecast construction toys have introduced more than trucks and tractors, and include well-known replicas from equipment manufacturers like Caterpillar, Bobcat and John Deere. Durable diecast toys have come in different sizes over the years. A couple of the most popular include Tonka and Matchbox. Since those early days, they have expanded their product line and in 1991 joined the Hasbro family of toys. In 2004 they introduced the Toughest Mighty Dump Truck, followed by the Toughest Mighty Loader and Toughest Mighty Crane in 2006. Along with their Mighty-size trucks they offer a junior-size line, too. It wasn't until 1954 that they introduced the first Matchbox car, an MG TD roadster, a rare Matchbox coveted by collectors. 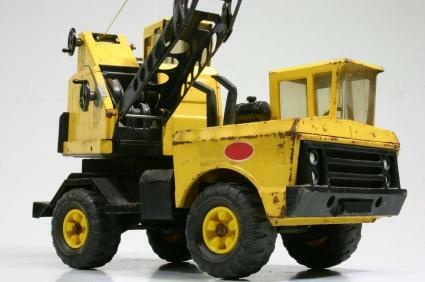 The construction toy niche in the collectibles market for diecast toys is big. Among them, some names stand out more than others, but if you are in the market to start collecting, be sure to look around at what is available. Part of the fun is to buy toys you really like or always wanted as a kid. Collectors have enjoyed John Deere diecast toys for decades. Spec Cast Collectibles offers a downloadable catalog listing John Deere and other diecast collectibles complete with color images. It includes an assortment of tractor equipment as well as the John Deere MC Industrial Crawler with Blade. Aside from the hours of fun they provide, diecast toys have distinct advantages over most other toys. First of all, they are durable. Not only will they stand the wear and tear of your first child, but chances are they will last through all your kids and be passed on to your grandkids, if you don't sell them. Along with durability, another advantage to owning diecast toys is that, if you take care of them, they actually can increase in value with today's collectors looking for toys. In most cases, larger diecast toys are worth more than their smaller counterparts, but owning a toy you really like is priceless.